CRNYC’s robust prisoner correspondence increases collaborations across prison walls in order to build stronger inside/outside organizing, uplift analysis and strategy of imprisoned people, and bolster prisoner perspectives and prisoner led advocacy. Below are some examples of this work. Critical Resistance New York City hosts a monthly volunteer night to help us maintain connections with people imprisoned in New York and along the east coast, share information and resources, and develop abolitionist vision and strategy beyond prison walls. Join us on the third Wednesday of every month to volunteer and learn more about our work in New York and nationally. ACCESS: No ID is required for building entry. This office is accessible by elevator, please buzz and wait in the elevator to be brought up to the 5th FL. 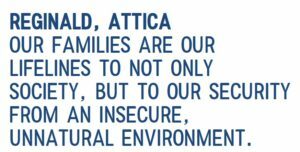 The Attica Interview Project was initiated by Critical Resistance to support prison closure organizing in New York. Through oral history and organizing we seek to document the continued legacy of repression, survival, and resistance at Attica. By producing media as a resource for building movement, we strive to highlight the experiences of formerly imprisoned people and their visions for transformation. Critical Resistance would like this project to contribute to the broad struggle to end the violence of imprisonment, policing, surveillance, and political repression. 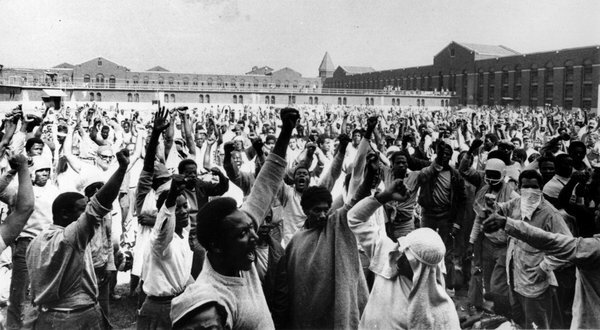 More specifically, the Attica Interview Project works to connect people who lived through imprisonment at Attica before, during, and after the 1971 rebellion, and build their leadership in the fight to close it. For these interviews, we will use a combination of video, recorded audio, and still images. Our documentation is grounded in a philosophy of self-representation – that people who participate determine how and when they are photographed and recorded. We strive to represent interview participants not as victims, but as agents of social change struggling individually and collectively to improve their lives and conditions. People’s Victory! 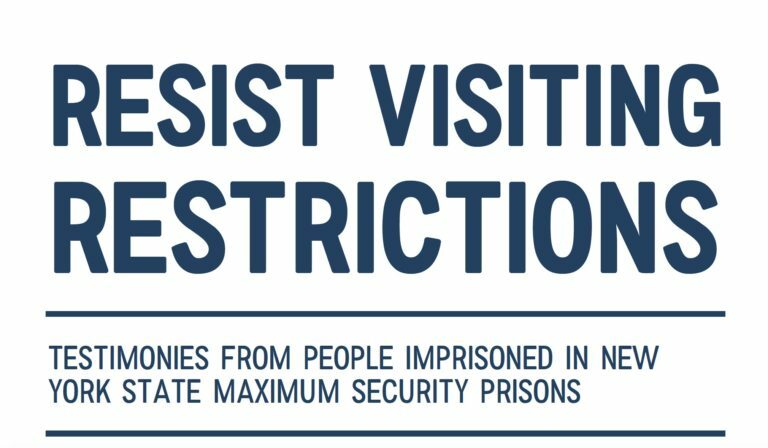 A broad and vibrant effort by New Yorkers defeated Governor Cuomo’s plans to reduce visiting hours at New York’s maximum security prisons. Artwork by Innosanto Nagara for MamasDay.org and Strong Families network. This spring Gov. Cuomo proposed to cut back visiting days at New York State maximum security prisons to three days a week instead of the current seven. A broad and vibrant front of organizations and community members, listed below sprang into action to fight, knowing this measure would cause suffering and separation for thousands of imprisoned people and their loved ones. Imprisoned people, loved ones, community organizers, lwyers, and advocates highlighted the ways that visiting is vital and essential for people’s wellbeing and stability inside and outside. 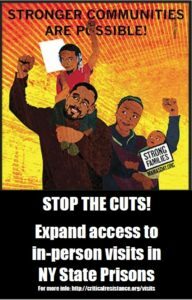 Critical Resistance-New York City bolstered this effort by discussing with people who are currently imprisoned in New YorkState maximum facility prisons about the visiting cuts, producing a report that highlights people’s opposition and analysis. solicited testimony and analysis from. To protect against potential retaliation, we have only included respondent’s first name and location, when preferred, or their otherwise requested title.We hope this collection of testimony will be used as a tool in the fight against limitations and cuts to visitation today and beyond. You can check out the report here. Through powerful testimony and pressure on decision makers, we forced the Governor to remove this cut from his proposed 2017-18 budget. We’re humbled to be part of the powerful movement of dozens of organizations and hundreds of community members across the state that demanded that the Governor cancel his proposal. We hope that together we will continue to fight strongly and powerfully against the restrictions that the prison industrial complex attempts to impose.